By Geoff Burling, Chief Executive Officer — This article was originally published in Microwave Product Digest, June 2018, and is republished with permission. Satellites have also provided those people with an unrivaled form of communication and the ability to know their position on the planet down to a few inches. And yet some would argue that we are still only scratching the surface of the purposes to which satellites will be put. While, in general, as individuals, we might be aware of some of these current and potential opportunities, perhaps the greatest benefits seen in our daily lives and which we use on a daily basis are those of communication and navigation. The novelty of those early days of long distance television transmissions and telephone traffic may have worn off; however, the enthusiasm of industry to continue to exploit the vision of Arthur C. Clarke has not dwindled and, thanks to revolutions in electronics, software and signal processing, the use of satellite links is still enjoying the expansion from the initial explosion. While the payloads on board our orbiting satellites have gone through several generations of performance standards systems on Earth have not stood still, either. No longer is equipment at the terrestrial end of the link comprised of just large fixed parabolic dishes and endless racks of equipment, new antenna technologies, solid state microwave techniques and digital electronics have all shaped the commercial and military use of SATCOMs to the point where even small hand-held devices make use of this incredibly versatile phenomenon. The result is that we now see satellite communications kits appearing on boats, planes, trains and road vehicles. Miniature transmitters and receivers can be packed into suitcases and soldiers’ backpacks. So many of the services we take for granted in our daily lives would be lost without it and therein lies another connection with modern day expectations — reliability! In those early bird days of 50 years ago, it was accepted that the loss of a satellite signal was par for the course and worth, occasionally, putting up with. Today’s world is less tolerant, and rightly so with severe logistical and financial down sides to breaks in transmission. The need for reliable equipment and with it the essential and thorough testing both in manufacture and in service has never been greater. While the reliability of radio frequency (RF) and digital technologies has increased manifold over the decades, so has the cost of equipment failure. One only has to consider the potential loss of advertising revenue, measured in millions of dollars per minute, for a commercial TV station if coverage of a major news or sporting event is interrupted. Of course, there is no substitute for thorough testing of all forms of satellite communications equipment, in the factory and as it is built. Whole terminal installations will often go through an elaborate commissioning process, but SATCOM is a live activity and nothing should be left to chance in getting good clean RF signals to and from the satellite. 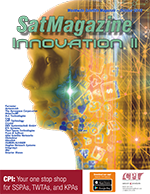 Failure or poor adjustment of a SATCOM transmitter has the ability to not only break continuity for its owners but also seriously upset transmission of other satellite users with consequent penalties, often financial. There are other reasons also for wanting to test that vital RF link. Whether the equipment is designed to provide internet connectivity to airline passengers or to deliver key data to armed forces, both the manufacturer and other users will want to know just how well it does its job and how far its performance envelope can be pushed. Simulator. Front and back views. One way to carry out suitable RF testing, of course, is to switch on the SATCOM equipment for a live test on the satellite but to no surprise, this is no more popular with the satellite owners and other users than a ‘dirty’ transmission from a failing terminal. Enter the ‘off-air’ loopback test. The transponder on board an LEO or MEO satellite, among other tasks, performs the function of a frequency converter, taking in the uplink frequency from earth and sending back the signal at an offset frequency. This is a function which can be very readily accomplished on Earth for test purposes and, with the use of microwave mixing suitable level adjustments and filtering, the loop test translator is born. The Loop Test Translator, or LTT, is cabled into the ground station’s array of transmitters and receivers such that, in test mode, a fraction of the uplink power normally destined to reach the satellite, is looped back to either the receiver or modem so that checks on spectral purity and modulation can be performed. This use of the LTT can be either occasional, for set up alignment, or continuous for quality monitoring. powered unit is mounted on a cherry picker. UK-based AtlanTecRF has been delivering this kind of LTT for many years in a number of forms. In its most basic, the ALT Series (pictured in Figure 1) simulates the satellite link converting the transmit (Tx) signal to receive (Rx) frequencies. All adjustments are manual and local to the 19”x1U equipment. Not all stations are constantly attended, however, and manual adjustments are not possible. Therefore, where control of a loopback test has to be undertaken with remote control, AtlanTecRF offers the ALR Series (Figure 2). In these units, the variation of turnaround, or local oscillator (LO) frequency and signal level attenuation is achieved via Ethernet and, with internet access, basically from anywhere on Earth. Both the ALT and ALR Series have models for each of the commonly used SATCOM bands including S-, C-, X-, Ku-, DBS, Ka- and Q-bands. Each is also available in a choice of housing which includes the usual 19 inch rack mount as well as bench instruments, battery powered, ruggedized portable and weatherproof outdoor (Figure 3). Cabled-in test solutions from AtlanTecRF continue with programmed control models where the main applications include testing of SATCOM systems in production as these come off the assembly line. For this purpose the previously mentioned housing options are joined by a 6U plug-in module (Figure 4) for ATE set-ups. to go “live” on a satellite. However cabling-in is not always possible and, in many of the current genre of SATCOM terminal, an LTT would be precluded because of its size. It is this type of application which has given rise to AtlanTecRF’s range of Satellite Simulators. These operate with no physical attachment to the system under test (SUT), instead achieving the desired loopback via microwave antennas, just as in the live on-satellite operation. The first such Simulator product out of the AtlanTecRF stable was its LSS Series (Figure 5) initially designed to operate in Ka-band with 30 GHz uplink and 20 GHz downlink. To start with, these were aimed at the testing of antennas built into the fuselages of airliners for passenger internet provision (see Figure 6) — variants have also become available for putting most kinds of portable SATCOM systems through their paces. In the satellite news gathering (SNG) industry, a different problem arose because the SNG vans would have to travel out from their depots, gain a good ‘view’ of the satellite and then carry out testing. 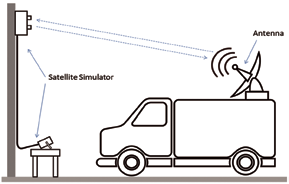 This was a costly and time consuming process but AtlanTecRF’s SNG Series of Ku-band Satellite Simulators have enable broadcasters to run tests on the SNG van at the TV station’s depot, saving time and money, while also improving reliability and revenue generation (see Figure 7). These SNG models come in two parts: a weatherproof transponder unit, attached to a wall or mast, and a base control unit in which the test adjustments can be made either manually or remotely from a control room. Variants of such products, mostly in Ku- or Ka-bands, incorporate two transponders with the purpose of simultaneously testing two terminals and these Multi-Path Simulators are designated MSS Series by AtlanTecRF (Figure 8). With the previously described Satellite Simulation Systems, there is the need to mount a transponder on a structure of some kind — wall, pole or mast — but such a provision is often not available where some mobile or fly-away terminals are to be operated. AtlanTecRF had to propose another method of getting the transponder aloft. The choice was made to opt for the popular drone or UAV and a specially designed miniaturized and lightweight package was created (see Figure 9). operator can easily test the terminal’s satellite tracking. Once launched, it became clear that the Drone-Mounted Satellite Simulator possessed even greater versatility by virtue of its ability to move as opposed to the other transponders attached to a structure. In many satellite terminals which are on a moving platform, such as a ship, aircraft, train or vehicle, the antenna is required to change orientation to track the satellite position. Therefore, instead of maneuvering the mobile during a system test, the drone does the work, allowing the SUT to carry on in its normal operating mode (Figure 10, next page). 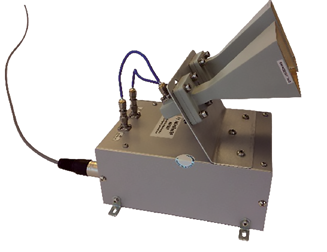 Having broken new ground in satellite simulation, these airborne test transponders are now attracting attention as primary communication platforms, where the ‘satellite’ communications system uses all the same ingredients as usual, except for the satellite! Naturally, a transmission from a drone, high flying aircraft or high altitude balloon platform (HAPs) will not generate anything like the same foot print of coverage as a geostationary satellite. However, in some applications the abilities of the geostationary satellite are just not needed and, over a relatively small area, this new form of communication offers a more cost-effective alternative. Therefore, in some cases, the test product is replacing the system it was testing and, behold, a further generation of SATCOMs is born, sans satellite. Military users have been among the first to seize the benefits of such alternative platforms and there are clear advantages to those where certainty of transmission is critical in a deployment zone. What’s more, whereas the equipment on a geostationary satellite is beyond reach of service or repair, it’s no big deal to bring a drone or balloon back to Earth to replace malfunctioning equipment. Space-qualified systems are not needed with consequent and major reductions in acquisition and operating expenses. However, there are further military advantages to be had. If a drone mounted transponder payload can ‘pretend ‘ to be a satellite for the purposes of system testing, it can also use this pretense ability to fool an enemy. How can a team of combatants be certain that the signals they are sending up to their satellite are not being intercepted and how can they further be sure that the data they are receiving is actually from that satellite and not a spoof from elsewhere? 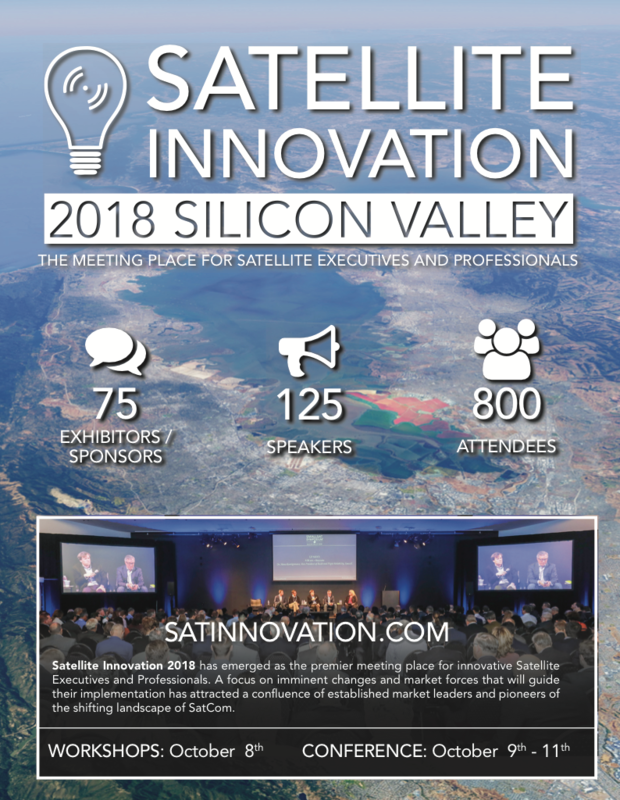 Satellite communications have opened up a whole new world of connectivity over the past 50 years or so with new applications appearing frequently; however, the need to test has now also had its own influence on communication growth and, in some ways which might not have been predicted. The future is, therefore, bright for applications of microwaves, a phenomenon of physics which is difficult to replace. AtlanTecRF has been at the forefront of SATCOM RF testing for many years and now finds itself leading the way internationally, in satellite simulation with both standard and bespoke product offerings for every variant of the technology. AtlanTecRF is a leading global manufacturer of RF and microwave equipment, components and interconnects and is based in Braintree in the U.K. The company specializes in providing SATCOM RF test equipment to Commercial, Military and Government organizations. The firm’s comprehensive range of equipment includes Loop Test Translators, Frequency Converters, Signal Generators, Noise Injection Translators, Noise Generators, Line Amplifiers and Satellite Simulators. Equipment covers L-, S-, C-, X-, Ku-, DBS, Ka- and Q-bands. Geoff Burling is AtlanTecRF’s CEO. His role, to drive growth across all aspects of the business by bringing to market a range of new and high quality RF and microwave components, interconnects and equipment. Geoff sets the company’s long-term business strategy and takes the lead in building customer relationships and developing employees. A passionate engineer, who uses his in-depth knowledge and market expertise to ensure AtlanTecRF delivers the highest quality products, technical expertise and customer service demanded by today’s engineers.